First off, this is a review for the film version of The Reader, the book version can be found here. I don’t normally review films here (hell, I don’t usually watch films! ), but this is for Two Bibliomaniacs’ Book to Movie Challenge. I’m terrible at watching the films after I’ve read the book. Terrible. I always mean to but reading other books always seems to take precedent over watching the film until I forget why I wanted to see it in the first place. 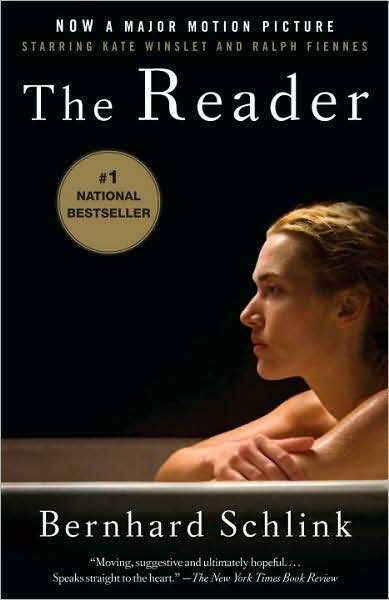 The Reader was an excellent one to begin with – it’s easy to see why it won so many awards. It really captured the feel of the book, both during Michael and Hanna’s affair and afterwards in the courtroom. The best way I can sum up the feeling of the film is to call it ‘beige.’ If you’ve ever seen a war film, I’m sure that will make sense. The atmosphere in the courtroom was intense, perhaps more so than in the book as the lengthy legal paragraphs that bogged down the story were broken up. The legal principles were cleverly explained, as in the book they’re simply explained in the narrative. Instead, they’re discussed among the students back at the University, a place never actually seen in the book. It was explained very simply too, without assuming you have a prior knowledge of the law, a trap many legal films fall into. The issue of German guilt was dealt with nicely too – how the generation born after the war blamed their parents and other adults for not stopping the horrors committed in the concentration camps. It’s a central theme of the book that doesn’t feature so much in the film, but it works nevertheless. It again takes the form of an argument that occurs in the seminar at University instead of Michael just pondering the moral issues to himself. I’m not surprised Kate Winslet won an Oscar for her performance – this is easily her best film. She’s just perfect as Hanna, from her brusqueness during the affair to her vulnerability after the trial. I couldn’t find a single fault. Her subtle avoidance of books was artfully carried out and the look of betrayal on her face and the end was so moving I nearly cried. Speaking of, that scene was amazing. It hurt me inside more than the book did, and the book was pretty powerful. Ralph Fiennes was good as a distant, apathetic carer but Kate Winslet was better. Its rare that a scene in the film can be better than the book but its true here nevertheless. Unfortunately, the aspect of the book that I found so clever was the one thing the film-makers didn’t quite manage to achieve. In the novel, Mr. Schlink manages to completely differentiate the sections of the book pre-trial and post-trial – the characters are different and the atmosphere just feels different. The film doesn’t really seperate the two, perhaps because Michael’s fifteen year old self isn’t quite vulnerable or naive enough and the older Michael just stares moodily off into the distance a lot. All in all, a great start to the Challenge. It leaves a few bits out, but not crucial ones, and it sticks to the book almost perfectly. It’s well worth a watch, but I’m not sure how interesting it’d be without seeing the film first. This sounds great….it is a book club choice for the month of August for me. THANKS. Love your blog name…NEW FOLLOWER and a new e-mail Subscriber. Stop by my blog if you like for a Father's Day Book Giveaway.